Be the first to share your favorite memory, photo or story of Gracie. This memorial page is dedicated for family, friends and future generations to celebrate the life of their loved one. Gracie Carolene Carter Cribb, known as “Carolene” to friends and family, 90, widow of Clinton Leroy Cribb, died Friday February 15, 2019, at Tidelands Georgetown Memorial Hospital. Mrs. Cribb was born on August 24, 1928, in the Pleasant Hill Community of Georgetown County. She was the fifth born child of the eight children of Jackson Joseph Carter and Margaret Gertrude Marsh Carter. The other sibling were, Allen Levay, Annie Bertha, Elbert, twins, Dorothy and Dalmar, Jessie Willard and Libby. Carolene married Clinton L. Cribb in 1950. They had one child, Kathy C. Thompson (David). She had one granddaughter, Kristen T. Long (Spencer) and two great-grandchildren, Jackson Spencer and Bevan Caroline Long, all of Georgetown. Mrs. Cribb also had several nieces and nephews she loved dearly. She was employed with Belk Department Store of Georgetown for twenty five years. Later she retired from Georgetown County School District. Mrs. Cribb was known for her love of cooking and entertaining. 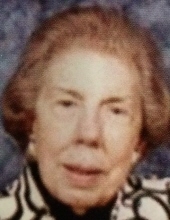 She was a member of First Baptist Church of Georgetown where she attended Ruth’s Sunday School Class. Funeral Services will be held at three o’clock Monday afternoon, February 18, 2019, at the First Baptist Church of Georgetown. The Family received friends one hour prior to the service from two until three o’clock. Officiating was the Rev. Keith Wall. The Georgetown Chapel of Mayer Funeral Home assisted the family the family. To send flowers or a remembrance gift to the family of Gracie Carolene Carter Cribb, please visit our Tribute Store. "Email Address" would like to share the life celebration of Gracie Carolene Carter Cribb. Click on the "link" to go to share a favorite memory or leave a condolence message for the family.